The new school year is only a month away and I’m trying to make sure I cover as many bases, organization wise, as possible before Labor Day weekend. I can’t say I’m ready for the new school season, but it is here whether I’m ready or not. 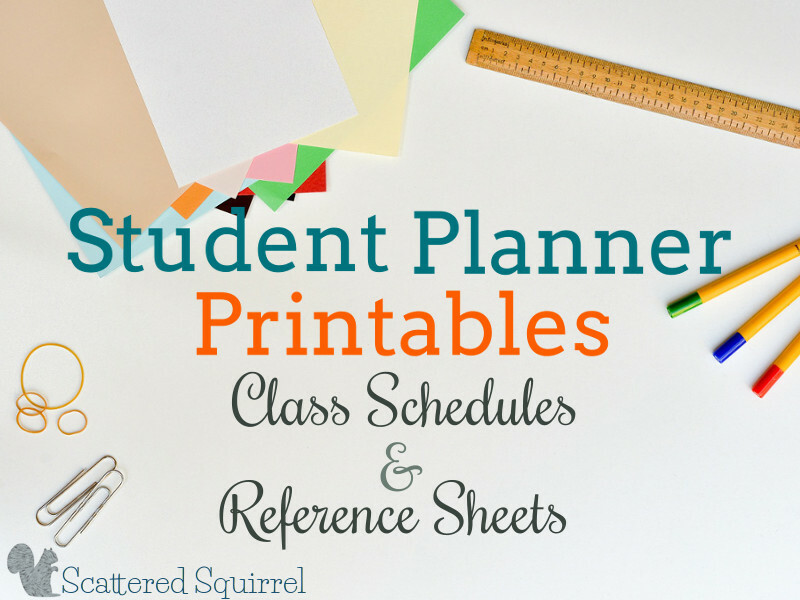 As part of our Back to School preparation, I’ve been working away on some new printables for the student planners. 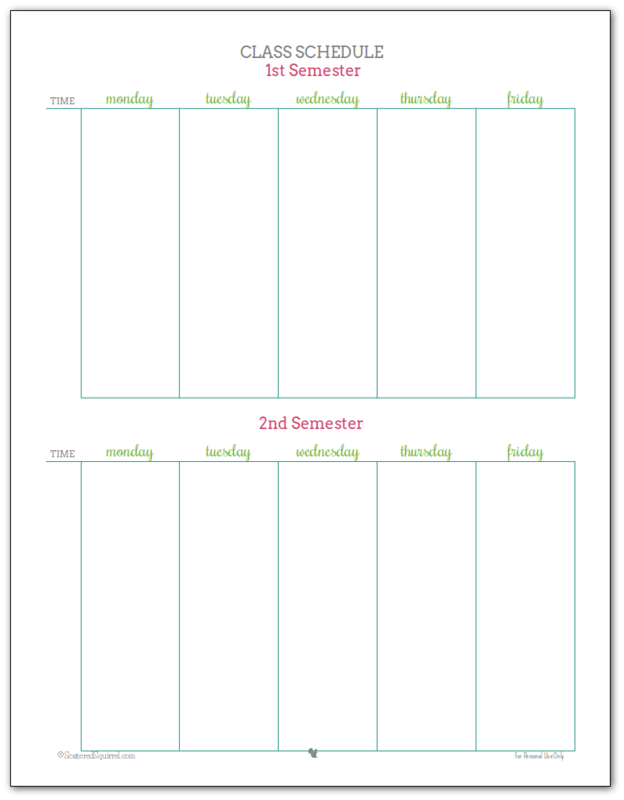 Last time I shared weekly planner and homework planner printables that were designed specifically with students in mind. Today I’m back to share a few more printables that might come in handy for the student in your life. High school and University student will be the first to tell you that there is a fair amount of information that they get bombarded with at the beginning of a new school year. Every school district is different, just like every teacher is different, but I’m pretty sure the following printables will be a welcome addition to most student planners. This one is rather important, because the last thing a student needs to worry about, especially at the beginning of a new year or semester, is forgetting which class to go to next. Having a copy of their class schedule in their planner is a great way to make sure they always have the information to reference. Assuming that they don’t forget their planner. Knowing that schedules vary from school to school, I opted to leaves these as basic spaces that each student can then tailor to fit how their school organizes the classes. If you scroll down a little further you’ll see an example of what I mean. 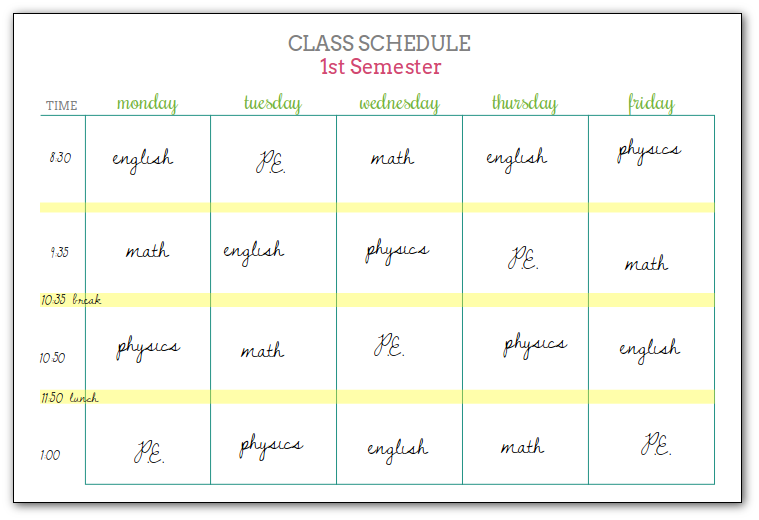 As you will see in the example below, I sectioned the weekly grid to fit the school schedule using a highlighter. I then jotted down the times for each period and break and then filled in the boxes with the appropriate class. I’m sure other people will come up with their own way of using these, but this is what I had in mind when I made them. Knowing which classes you have and when is only the first half of the student planner printables that I’m sharing today. In addition to knowing when each class is, it’s sometimes helpful to have a place to keep track of other information that is important to each class. These are pretty much exactly what they say they are – a place to store information about each class that you might need to reference later. and anything else that might be important. What else might be important? Well a teacher might have certain requirements that all assignments must meet to be graded properly. Perhaps they have a quirky rule about homework, or requiring not just your first and last name but your middle initial as well on everything that is handed in. 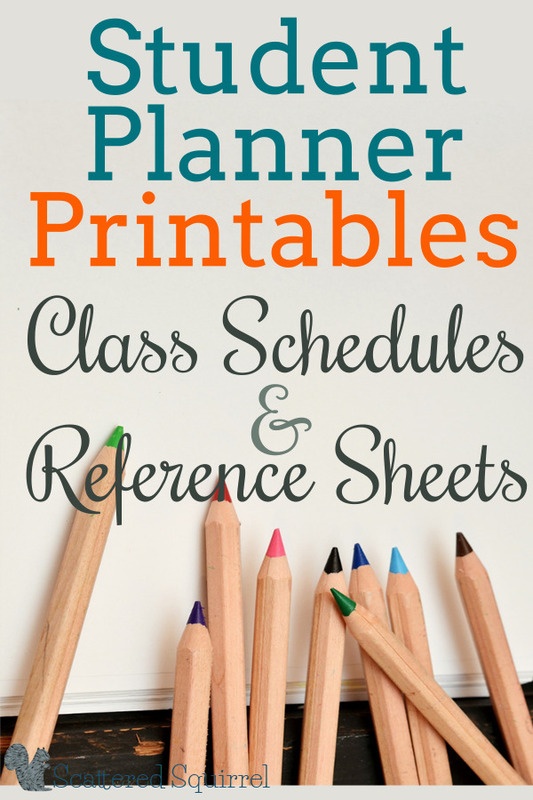 This printables allows student to keep that information all in one place. I hope that you or your kiddo find the above printables helpful as this school year gets underway. Even if they’re only needed for the first couple of week, having them on hand might bring a little bit of peace of mind. As always, to grab a copy of these printables for yourself, simply click the pictures. 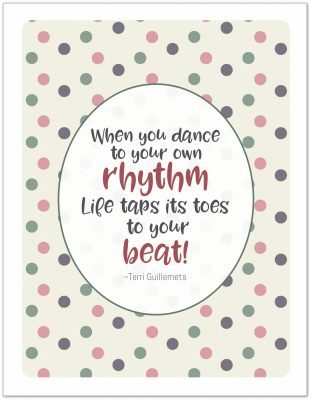 And don’t forget, if you’d like them customized to suit your tastes or needs better you can hop on over to the Customized Printables page and send in an order. Inquiring Minds Want to Know – What else would you include in a student planner? Previous Post: « Printable Updates – As Requested by You! These look very handy. I remember back to all of the things I needed to know in school and having a planner would have been very helpful. You come up with great ideas! Pinned. Awww thanks Sheila. The class reference sheet would have been so handy during my highschool years, it seemed like every teacher had different rules and requirements for everything. lol Thanks for sharing. Class schedules can save one’s rear! We would get little slips of paper from the school with our schedules on it, and trying to keep track of it was never fun. Something binder sized, to just be slipped in with everything else (as in not as easy to lose!) would have been awesome to have! And, if one is good at keeping track of their binder, that sheet would be a decent spot to stash a sticky note with locker number and combo (something that also comes on an even smaller piece of paper that is easy to lose!). I was so disorganised at school these planner pages would have made my life so much easier – where were you all those years ago?? I was very disorganized during school too, and we had a planner that we all had to have. But it was more of a weekly planner to keep track of assignments. I don’t remember any of them having anywhere to write down our schedules. your home organizer & house keeping printable are fantastic tool. I wish I had come across these way back. I bet it will help me organise myself a lot better than ever. Thank you so much. Ahhhh I’m so happy I found this site. I’m a future law student trying to make a custom planner for myself. I’m trying to create a weekly homework tracker with separate sections for what’s due in class and what readings need to be completed. Some kind of a textbook management section would also be great for university students. Which textbooks need to be brought to which class on what day and the like. Maybe also some planning pages for writing papers? 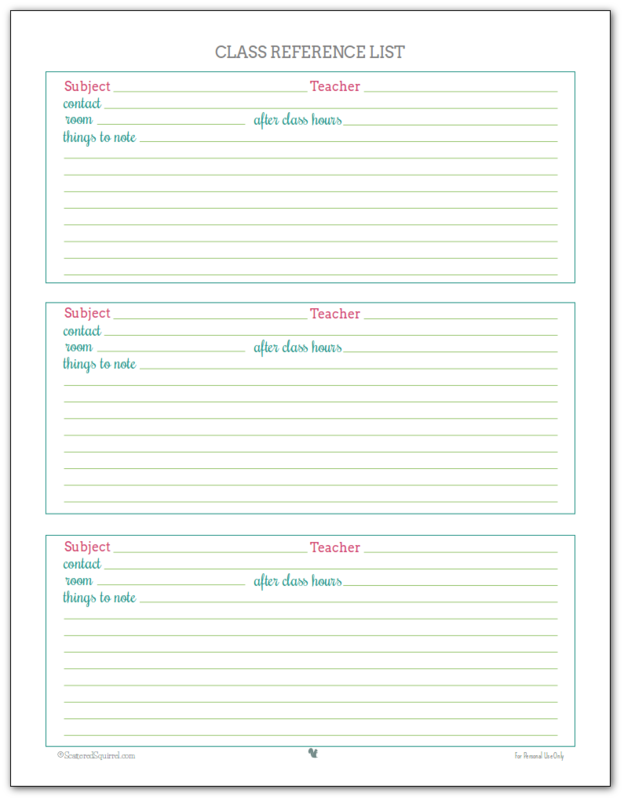 Also your half size printables – would they work for a 6×9 planner? That’s what I’m trying to make and I have just fallen in love with your designs.